Beaverton City hall is located at 4755 SW Griffith Drive, Beaverton, OR 97076; phone: 503-526-2222. Photo: Fanno Farmhouse, ca. 1859, 8385 Southwest Boulevard, Beaverton, OR. Listed on the National Register of Historic Places in 1991. Photographed by user:Finetooth (own work), 2008, [cc-by-3.0 (creativecommons.org/licenses/by/3.0)], via Wikimedia Commons, accessed August, 2013. Beaverton was established in 1868 as a shipping point along the Oregon Central Railroad. Its name is derived from the rich beaver-dam lands found throughout the district. 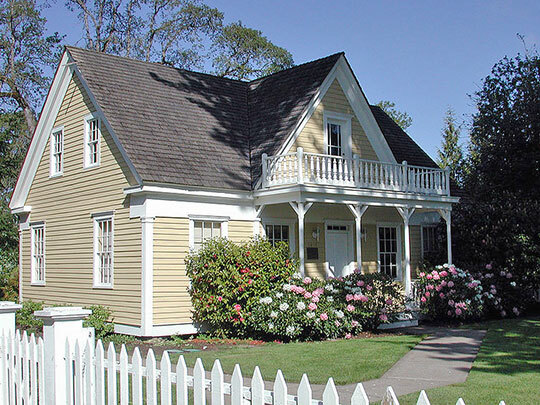 Beaverton, once a quiet farming community built on low beaver-dam swamp land, developed as a speculation town due to the railroad interests during the late 1860s. The first plat of Beaverton was completed in 1868, and the town soon thereafter became a major terminal on the new Willamette Valley Railroad line (later becoming the Southern Pacific). The population increased from 100 to 500 citizens in 1880, and Steel's Addition to the City was platted the following year. Though the incorporation of the city occurred in 1894, government policy was slow to develop; the first city ordinances were not passed until 1905. Another large population increase occurred in 1921; the community had become more accessible due to the daily Oregon Electric and Southern Pacific commuter services and the popularity and accessibility of the automobile. Within the next few decades, Beaverton grew into a sophisticated city with concrete sidewalks, a new city library, airport, and an expanding commercial center. Though many of the early wood frame buildings that once line SW Broadway and SW Watson Streets have been replaced by masonry buildings constructed from 1914-1940, Downtown Beaverton continues to convey its sense of "central place." The Southern Pacific and Oregon Electric Railway tracks still bisect the downtown district, and the street patterns and density of buildings have not changed since the commercial area was first platted in 1868. The remaining early 20th-century buildings create a unified core downtown district with echoes of its past history. In its natural state, the Beaverton section of the Tualatin Valley was a heavily wooded, gentle lowland. But through the beaver's construction of dams and canals, the terrain had become packed by marshes and ponds. On the main stream, Beaver Creek, the beavers had built a large, shallow lake which stretched for miles. The French Canadians started trapping the beavers for their pelts in 1830; over 100,000 animals were trapped every year. Because of the over-trapping, the beavers in the area were extinct by 1844. The beaver ponds and lakes, however, remained. Though the Tualatin and Atfalatu Indians lived near the beaver dams prior to white settlement, they chose not to settle in the Beaverton area as the ground was too marshy. It was not until the late 1840s when white settlers, Augustus Fanno, Lawrence Hall, Thomas Denney, Samuel Stott, Peter Spencer and others came to the area, that the potential for rich farmland was discovered as the swamps were drained. Though the Beaverton area was quite inhabited by 1851, there were no organized businesses, schools, churches or roads. The Samuel Stotts occupied a farm in the center of the future town. Circuit riders who were based in Forest Grove fulfilled the settlers' religious needs, and supplies were purchased in Hillsboro. People traveled on horseback on rough roads, cut through the woods. The breakthrough for settlers in Beaverton and Portland was the development of Canyon Road in 1851. Portland businessmen saw the great need for a road between the Tualatin Valley farms and Portland docks ... these businessmen wanted the stimulus of Tualatin Valley trade and valley farmers wanted a closer outlet for their produce. The charter to build Canyon Road was given to the Portland and Valley Plank Company in 1850 and the laying of the first plan; in the road took place in September, 1851. Due to the unfortunate financial difficulties of the company, only a portion of the road was laid with planks, to Sylvan; the rest of the road was laid with corduroy logs. Canyon Road remained a "corduroy road" for many years, proving difficult for more than one team of horses or vehicles to pass. The effectiveness of this early road was thus somewhat lost, until it was improved and paved in 1930. The 1930s were busy years for city improvements in Beaverton. A regular city fire department was added to the payroll in 1931. Concrete sidewalks were constructed throughout the city and the city library was built in the same year, funded by the Works Progress Administration. The population increased to 1,138 citizens. Much of the population growth that occurred was in the residential area of Beaverton, and it became known as the "City of Homes." Kimberly Demuth and Judith Rees, consultants, City of Beaverton Planning Department, Beaverton Downtown Historic District, nomination document, 1985, National Park Service, National Register of Historic Places, Washington, D.C.